Shaw House is actually Newbury’s Register Office but it is one of the finest Register Offices we’ve seen. It is such an historic house that the greater part of the building is actually a museum but the exterior of the house is magnificent and an absolute gift for outside wedding photography. It has a long straight driveway from the very impressive gateway up to the house frontage. To the right there are a small number of trees ideal for a foliage backdrop. Turning left at the trees gets you to the doorway and steps that the bride and groom can come down from. This is east facing so ideal for shooting group shots in the shade for bright sunny afternoon weddings. There is also plenty of tarmac there in case it’s been raining and ladies with high heals can’t stand on soft grass. Parking is ample and Shaw House is easy to get to from the A34 and Newbury - unless the Newbury Races are on, so worth checking the race schedule before booking your date perhaps. The interior is very nice and the exterior frontage to the house is simply breath taking. 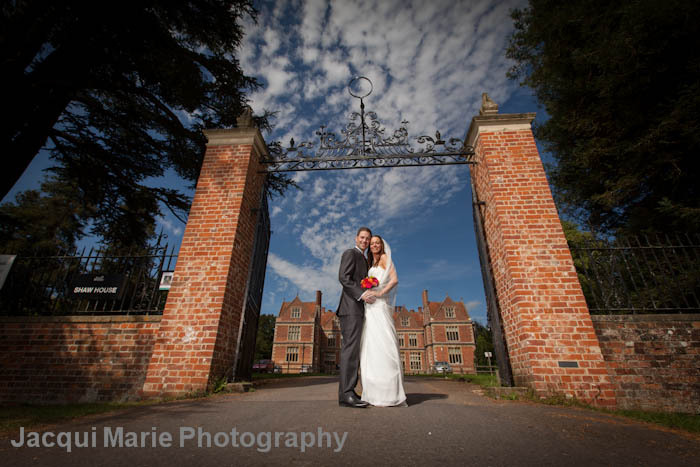 If you live close to Newbury, getting married at Shaw House could really be a Register Office wedding with a difference. Well worth investigating.